About 300 people gathered at the Platz der Republik. There were some speeches, one of them about the European border regime which already took tens of thousands of human lives. The demo started with half a round around Platz der Republik. A small police chain at Schleswiger street could not stop the demonstration. The demo continued at the Trasse bicycle route where police vans were not able to follow the demonstration. The demo left the Trasse at Mirker Bahnhof. At the AZ (autonomous center) there was a short stop with speeches about the „AZ bleibt an der Gathe“ (autonomous center stays at Gathe) campaign and repression against activists at Hambacher Forst. After that the demo continued with a zick-zack route through the northern part of the city. 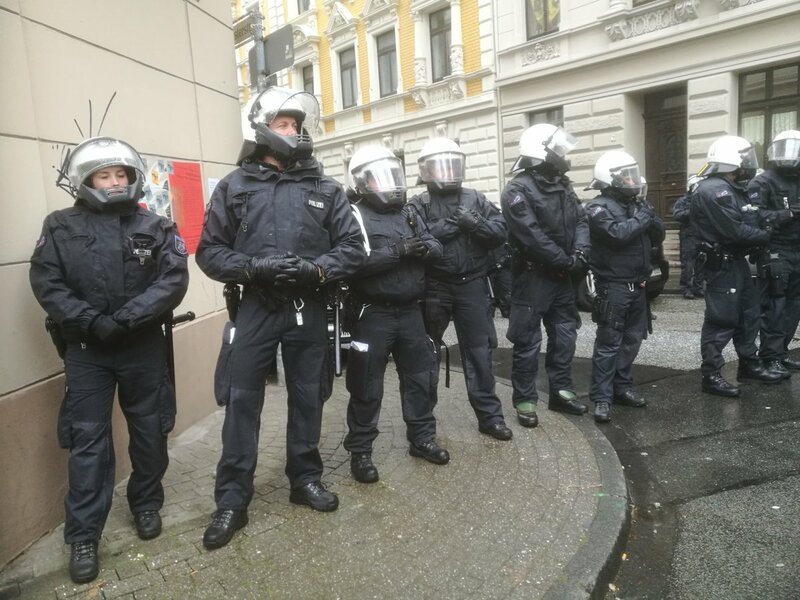 At Hoch Street the cops were confused as the demo turned backwards and went into Höchsten Street. It seemed that the cops expected the demo to end at Schusterplatz but the demonstration continued. At the same time the complete streetparty at Schusterplatz was also kettled. Over several periods of time people were not allowed to leave Schusterplatz. At Schneider Street there was one detention during the Schusterplatz kettle. The Ölberg district was occupied by an army of cops. At Marien Street a small group of youths, which neither took part at the Schusterplatz streetparty, nor marched with the demo, was fixed. Cops also checked their id’s. This action by the cops looked like a typical racial profiling operation, youths that looked German were not harassed by the cops in this situation at Marien Street. At Lutherstift cops sended away a woman who lives in this home for the elderly. By sending her away cops denied her right to go home! During this time the streetparty at Schusterplatz was halted to provide the attendants with information, which was good and important. That the Ölberg district didn’t explode on this years May Day equates a miracle. The cops didn’t only do everything they could to let things escalate because of the kettle and the unnecessary violence, also against neighbours and people who were just passing by. The whole operation was a provocative demonstration of power. This provocation by cops at the Ölberg district can and may not be left unanswered. Previous post: #Mayday: The Bay Shut Down ICE, The Ports & the Streets!